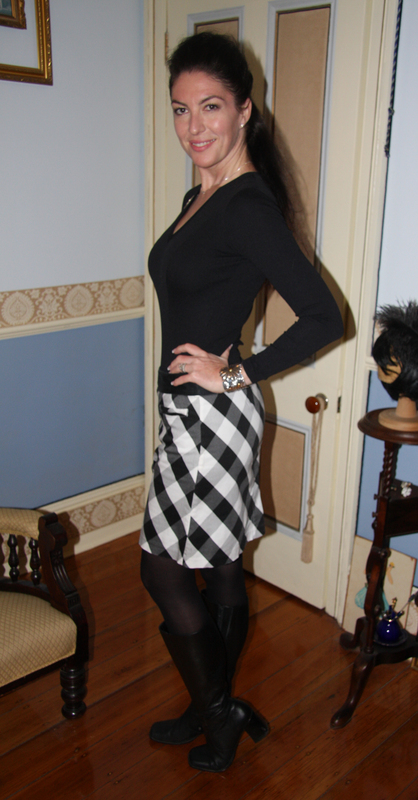 Outfit: Black long sleeve v-neck dance leotard (worn as top) with golfer’s skirt in black and white check (complete with built-in shorts!). Shoes: Knee high black leather boots. Hair: Half-up, pulled back and with texture. Accessories: Black opaque tights, sterling silver wide daisy cuff, sterling silver & cz solitaire pendant, diamond stud earrings, letter ‘D’ diamante pendant (pinned to top, worn as brooch).